As a project manager, it at times gets overwhelming when you have to keep a record of all the work you need to be done within a specific time and its pricing. However, with the help of a work quotation template, it not only enables you to be organized but it also saves time, promotes good communication and significantly contributes to project success. It is crucial to obtain a properly designed work quotation template since it reveals the company’s professionalism and acts as a platform to attract potential customers. A work quote example should include; business details, detailed estimated total cost, a breakdown of the costs, an explanation of the various variations that will affect the cost, the schedule for the work, payment terms and conditions, the quotation expiration date and the payment methods. 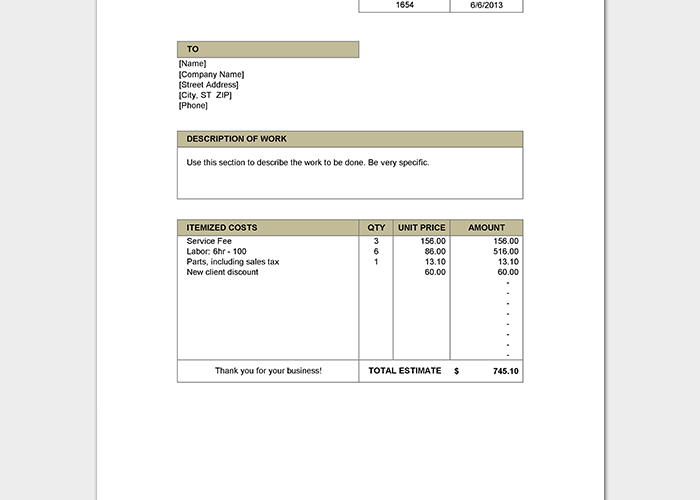 For individuals who work in a field focused on service, using a service quotation template is helpful since it allows you to estimate the costs before beginning the work and it also makes it easier to reference to an invoice. In addition, a service quotation template allows you to predict how much a job will cost and it is crucial in determining what need to be accomplished in a given project and whether there are any anticipated additional costs. On the other hand, an hourly quotation template is similar to a service or a work quotation template regarding its use, but the significant difference is that an hourly quotation template highlights products and services at predefined prices per hour. Thus, an hourly quotation template is useful for businesses that provide hourly services to their customers.